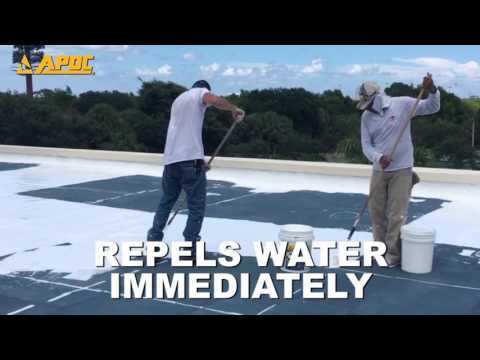 APOC® 587 Armor Flex® Miracle Roof™ is a moisture cure, fluid applied, high solids, silicone coating. Unlike other silicone coatings, Armor Flex Miracle Roof is specially designed and formulated to bond to almost all silicone coatings and sealants. Miracle Roof creates a shield of protection over your roof with Pond-Proof® Technology and cutting edge performance. Engineered with “Green” solvent-free polymers, Armor Flex Miracle Roof outperforms traditional solvent and solvent-free products including asphaltic, urethane, thermoplastic and other protective coating products. Additionally, Armor Flex Miracle Roof has minimal impact on the applicator or our environment. Why Armor Flex Miracle Roof? Because Armor Flex Miracle Roof Works! Armor Flex Miracle Roof is formulated to help reduce cooling costs, heat gain, carbon emissions and health hazards associated with these emissions. Electricity usage can be reduced and utility bills lowered. When applied according to the instructions, Miracle Roof creates a tough, flexible and resilient barrier that helps prevent damage from severe weather; and with proper maintenance, Armor Flex Miracle Roof will greatly extend the life of your roof!